Infographic courtesy of Julianna Eckman. On college campuses, feelings of stress and anxiety are prevalent and sometimes difficult to manage. Seeking a professional’s assistance is something that can be extremely beneficial for the betterment of one’s mental health. Two options available to students seeking assistance on West Chester University’s campus are the Counseling Center located on the second floor of Lawrence and the Community Mental Health Services on the eighth floor of Wayne Hall. While the two aim to assist students in managing the stress of their everyday work load and expectations, both have somewhat different timelines. “Our primary mission here is to train students in the doctoral program in Psychology. They [come] up here to get their clinical training and we do that by providing them with clients,” says Clinical Director Leanne Valentine, PhD. Students can come to the Community Mental Health Services for long-term service at a base-fee of $10 per session after their initial session, which is different than the short-term semester-long services offered by the Counseling Center. “Here, the difference is that the services are completely free, and we operate short-term. We see students individually, or in a group, for a semester’s worth of counseling. [Students] can be in as many groups as they want, just individual counseling is limited to a semester,” says Elizabeth Carper, LPC. Both counselors agree that it is not unusual for students to seek counseling for everyday needs and encourage those in need of someone to listen to speak with a counselor. “It’s not unusual for folks to want to get therapy for life-stressors. Things get rough sometimes, just getting through college is hard, and if you have other things that pile on top of that, sometimes you just need help getting through that,” says Valentine. The National Alliance on Mental Illness (NAMI) completed a report on college students living with a diagnosed mental illness to better help understand their college experiences. 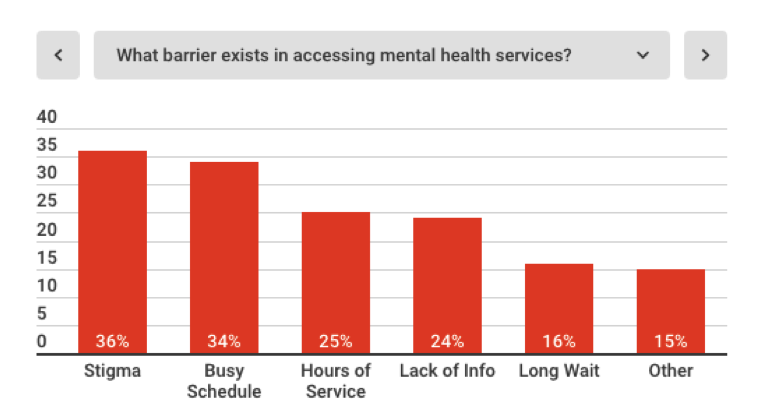 According to these findings, many students did not seek services because of stigma and the apparent lack of accommodations accessible to them. West Chester University offers services to all students willing to seek help. “I guess I look at mental health as more encompassing, not just a diagnosis. Most are impacted in some way, whether it’s within themselves or a family member who struggles from a mental illness,” says Carper. While some students may still feel uncomfortable seeking outside services, Carper shares that students can go to the Counseling Center’s website and answer online surveys. “We have something that’s called ISP, it’s an online survey you can connect to through the [Counseling Center’s] website that is anonymous; it just gives a brief mental health survey that gives an inventory of how you are doing and what symptoms you may be experiencing and one of the counselors from our team reaches out to you” she says. In addition, Valentine adds that one of the most important aspects of mental health is relationships and having support from friends and family. “I think students in many ways spend all day competing with each other. I would love to see them put that down a little bit and be able to see them ask each other for help. There is such a stigma around mental health still, which is something we need to get better at in this country. Letting people know that we all have our struggles and it’s okay to lay that burden down and to admit that something is bothering you and that you could use a little help; it’s important,” says Community Mental Health Services Administrative Services Manager Kirsten Leonard.